There is nothing better than thinking you are completely out of groceries…and then discovering that you have exactly enough to make a delicious batch of vegan carob chip cookies! Oooooh! These are horribly horrible for you…believe me, not everything vegan is healthy. But they are so yummy. Actually, I should give myself some credit for using whole wheat pastry flour, but even that is canceled out by the CUP of margarine! 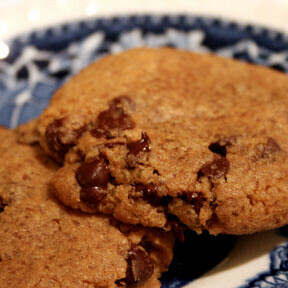 We rarely make cookies though…so this is a definite treat. Taken from one of my favorite cookbooks, Vegan With a Vengeance by Isa Chandra Moscowitz. Preheat oven to 350 degrees. Cream together the margarine and sweetener until fluffy. Add the molasses and vanilla. Add the flour, baking soda, and salt, and mix well. Fold in the chocolate chips. Drop by teaspoonfuls spaced a little over 2 inches apart onto an ungreased cookie sheet. Bake for 8-10 minutes, until just slightly browned. Let cool on the baking sheets for 5 minutes, then transfer to cooling rack. looks amazing!~ we love chocolate chip cookies in my house! i will try your recipe soon. My hubby made these last night for my b-day and used coconut oil instead of the margarine…they turned out really mushy…I think he added some rice milk b/c they were really dry but any thoughts??? Cranberry-Oatmeal cookies are decliious and have whole grains, too. 3/4 cup earth balance or other margerine1/3 cup raw sugar 3/4 cup raw brown sugar 1 tsp vanilla 1/2 cup soy milk 1 cup flour 1/2 tsp baking soda 1/4 tsp ginger powder 1/4 tsp cloves 1/2 tsp cinnamon 1/4 tsp nutmeg 3 cups rolled oatmeal 1 cup dried cranberriesMake the way you do with typical cookies- mix the wet ingredients, add the dry ingredients, and stir in the oats and cranberries last. Bake at 350 for 10-15 minutes. All your friends will love them.